Krambo had the most liked content! Post up the meet! If I am free, I will be there! Whats up Niko?! Hope all is well. Props man...10's is an accomplishment! ...I have been shamed! LOL! Yea, just noticed the posting dates. Being that I only stop in from time to time, I feel compelled to at least say something. Any tips for a noob trying out tuning? With the parameters you changed in the file, your scanner should still log commanded AFR unless you changed the default configuration in the scanner. Make sure you are using the standard default configuration (unless you intentionally changed it). My recommendation is to master the scanner function of the program first. Learn how to add and delete individual parameters, understand the stock histograms, create custom configurations and custom displays. Then you can move into a bit more involved scanning by setting up custom histograms and adding in a wideband o2 input. Logging commanded AFR against real time AFR from your calibrated wideband is just about the most important histogram you can run. For actual tuning, assuming you are using your stock O2 sensors as reference, start with dialing in your Ve table. There are TONS of tutorials on this and I think I even wrote one a while back. Once your Ve is close to perfect +/- 2-3%, go to your MAF calibration and dial in your same cruising range. In order to dial in your upper ranges (PE range) on both the Ve and the MAF tables, you will REQUIRE a wideband with data acquisition outputs. Pretty sure I wrote a "How-2" for calibrating your MAF somewhere on this forum...its bee a while. Once your fueling is dialed in, move into adding timing for some extra HP. Shift points, TM, speed limiter, code deletion etc. can be done anytime. Unless you are doing some rather big mods (Cam, Heads, blower etc.). you will not have to touch the tricky parts of the tune file (idle balance etc.). Once you become comfortable with the tuning package, you will find yourself tuning your Ve and MAF constantly to get to that perfect (and elusive) 0% error (AFR commanded vs actual). Also, once you are dialed in with fueling, you can tackle the KR you are seeing. My experience is that the knock sensors are very sensitive to false knock and should be desensitized in the tune file a little bit. Others say not to mess with it. Your choice. There are many types of true KR so read up on it and how to adjust. Tuning software can be very intimidating and dangerous if you do not know what you are doing. Start small and build on your knowledge base. Pretty soon you will be dialing in a massive head cam package with a some type of power adder! Oh, and find a local tuner and ask if you can watch over their shoulder. EVERYONE does it differently to achieve the same results. 130's MPH. Badass sir! It has been a long time coming but the reward is worth it. ...to the 65e haters, I am pretty much sure you have the longest lasting 65e in a 10 second, 5500lb AWD truck. Amazing. If it is surging, you tune needs work. Base running airflow, throttle cracker and follower tables (provided all other inputs are correct). Drilling the throttle body is not the ideal way to address the issue when you can simply change some idle airflow numbers with a few clicks of a laptop. I have successfully tuned pretty damn large cams with zero surging or sputter without drilling. IF you absolutely need to drill (with like a sewer pipe of a cam), somewhere on here buried in one of my posts is a correlation table of a (drilled) hole size to idle airflow...may be a good reference for your tuner. Mack! I just realized that my time is still 0.02 faster LOL! I can still have bragging rights for at least another month before you bury me by at least a half second... Merry Christmas. Hope to see you soon. Good advice here. 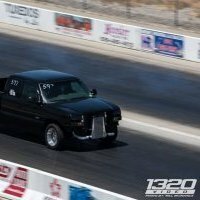 To the OP - Honestly, I saw very little performance gains going from 12.0 to 13.0 tailpipe AFR for a NA truck. I would target the range from CHP above. Eddie - CONGRATS! great time. Imagine if you were at a great track... Regardless, getting into the 10s in a 5500lb AWD street truck is awesome. We need to hook up and go to the track this spring. Island!!!! Can't wait to see them throw you out LOL! Agree with some above...I personally never owned a Corsa but have heard many. I like the sound and quality. ...interested to see the set-up that REQUIRES the 3 bar set-up. Must be a beast.